Under Article 27 of MiFIR, firms operating regulated markets, multilateral trading facilities, organised trading facilities and systematic internalisers are required to report reference data for instruments traded on their venues or platforms to their home regulators on a daily basis. Why do venues need to report this data? Standardisation, harmonisation and consistency of transaction reporting data have been the key drivers for national competent authorities to exercise their mandate of effective market monitoring. The rationale for requiring firms to do this is so that national competent authorities are able to interpret the MiFIR transaction reports they receive in a consistent and timely manner. It will also allow the regulators to compile a list of reportable instruments and enable them to validate reports they receive. The data itself is principally ISIN reference data, and must be supplied in a standardised format prescribed by ESMA to help them to identify any inaccuracies or incompleteness in the data supplied. What reference data needs to be reported? This must be done on a daily basis by at 21:00 CET, regarding all instruments traded or admitted to trading (including orders or quotes placed their systems) at any point before 18:00 CET that day. Instruments admitted to trading after 18:00 CET on the first day or orders or quotes placed for the first time must be included in the next day’s report, by 21:00 CET. (Art 2 of RTS 23). It should also be noted that the trading venue or systematic internaliser concerned shall obtain an ISIN code for the financial instrument prior to the commencement of trading. How does the reporting flow work? How can UnaVista assist venues with MiFIR reference data reporting? 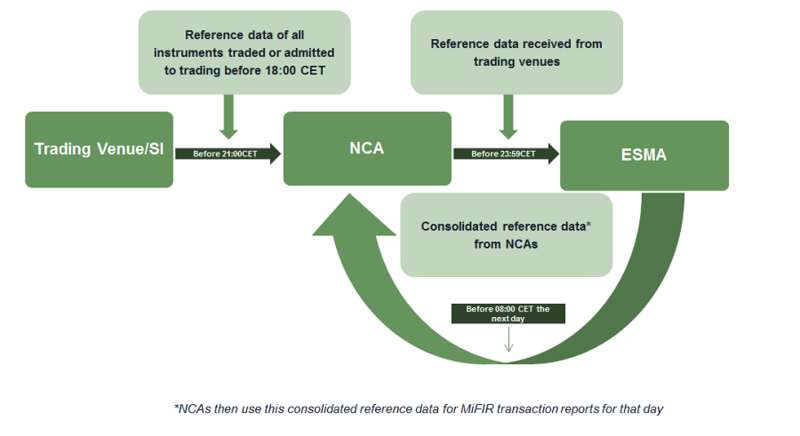 UnaVista has built connections to all of the European NCAs and can assist venues with routing their MiFIR reference data to the required locations. Using UnaVista’s Rules Engine firms will be able to ingest data from multiple source systems, before normalising, validating and enriching the data, and transforming data into the correct format for onwards submission. UnaVista can also assist trading venues and systematic internalisers prove that they have methods and arrangements in place to identify incomplete or inaccurate reference data submitted to their NCA. UnaVista offers data quality controls and reference data sample checks based on pre-defined templates for data quality reviews.